As I type this, my mouth is already beginning to water. I must look something like my dog, Hitch, just before I put his dinner bowl down. He gazes up at me with wide, hopeful eyes… his teeth glisten with saliva, and he licks his lips incessantly to keep from drooling. But we can’t help it, Hitch and I… it’s just natural that when your body knows it’s about to get something so tasty, so meaty and delicious, that the juices just start flowing. You’ve heard the term mouth-watering before, haven’t you? But last night, Jake and I experienced a whole new level of mouth-watering deliciousness. Last night, we baked bacon. It’s a technique we had heard rumors about, but never tried ourselves. And now? Although we missed the sound of the sizzle we were used to, our mouths watered at first bite and we squealed with bursts of mini-excitement. Okay, so maybe I was the only one of us actually squealing. Place 2 paper towels on a plate for afterwards. When the oven reaches 400, bake for 15+ minutes until desired “doneness” is reached. Using tongs, remove the bacon slices from the baking sheet and place them on the paper-towel covered plate to catch the extra grease (it’s a great fat to eat – I just recommend the blotting because it’s a finger-food). Fold your foil in half, and pour the leftover grease in a jar to save for cooking grease! We baked our batch for a total of 20 minutes. Our centers were still slightly chewy, so I might even bake them a bit longer next time. Because there will be a next time. The ends of the bacon were so light and crispy and the texture so even, it actually felt like it dissolved on my tongue in the most. awesome. way. So GO! Try it for yourself! Bake some bacon today! Brilliant! That way the grease would drip off of them, right? I 2nd that! And then you just pour the bacon fat into a bowl and save…or use it to make salad dressing. Mmmm. No fair – I’m reading this article while at school and I have to wait until I get home late this afternoon before I can follow this recipe. This will be my snack before sitting down and grading Biology tests. Mark Sisson had a recipe in the Primal bluprint cookbook for baking bacon. I think it calls for cooking it slower, on a baking rack (so you can catch the fat) at 250 (I think). It takes much longer but the bacon is nice and flat and you can save the fat for cooking. I forgot to add, that I like your quicker method. The PBCB method takes WAAAAY to long but it is supposed to help keep it from splattering. We love cooking it this way…sprinkle a little bit of red pepper flakes before popping it into the oven and it gives you some spicy bacon! Also, by accident, when we wanted bacon during a power outage we were forced to grill it on our gas grill…came out equally as delicious and does not stink up the house. 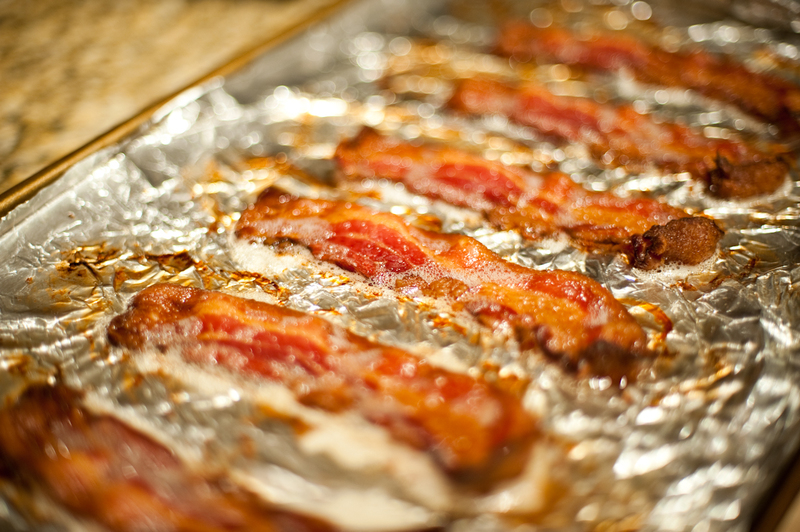 Put your bacon on a few layers of foil and make sure to roll up the sides creating a ‘bacon boat’…must cook on low heat and watch carefully so it doesn’t burn. Very tasty. Go bacon! I remember you telling me about the bbq bacon! Good tip. I also noticed that baking it left much less of a bacon scent in the house than compared to when we fry it. We’ve been doing the same for a long time. 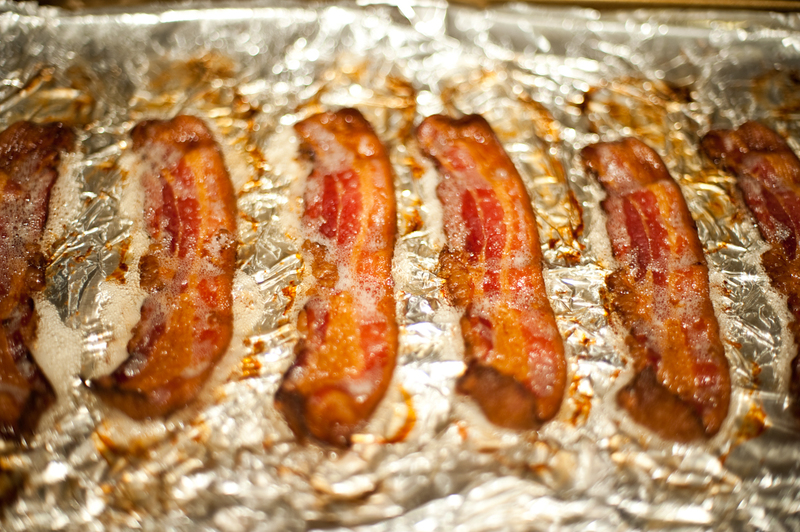 We use a pampered chef “bar pan” (stoneware 1″ deep) and simply lay the bacon directly on top w/out tin-foil. It really helps season the stoneware too! I’ve never had any trouble with splattering, even at 400 degrees. And, as someone else suggested, once you’ve pulled the bacon off of the pan (and let the pan cool a little), you can tip the pan and pour all of the leftover fat into a container (I use a heat-rated heavy glass prep bowl) and save it in the fridge to use for other cooking. Sounds like a good piece of cookware! Thanks for sharing! Late to the game here, but YES. I love using my Pampered Chef bar pan for baking bacon. No roasting pan or cookie sheet can hold a candle to it. I’ve been doing this for years and I find it less messy than frying (meaning I’m not wiping grease off the stove after) but I use parchment paper rather than bacon. Nothing sticks to the parchment paper EVER, but oddly enough the bacon can stick to foil if you make it crispy enough. Is Bill the Butcher’s bacon sugar/honey/maple syrup free and therefore whole30 approved? I haven’t been able to find any unsweetened bacon yet. Hi! Love the site and check-in often for new info & recipes (and to look at all the amazing photos!). I had to comment on this one though; I’ve recently read this article and extensive comments – and wanted to make sure you have seen it! I’m a beginner Paleo here in Seattle and have been on the hunt for grass-fed meat as well. I was excited about Bill until I read this. Just wanted to keep you in the loop! Yes, that’s an older article that we read last year. Since it came out, Bill the Butcher has been much more tedious about their labeling. Not all beef there is grass-fed, so just like any place you shop, you have to do your research and ask all the right questions to ensure you’re getting exactly what you want. Oh, that’s great to hear! I will have to go in & check it out. Since I’m new to paleo I just saw it on the internets & just thought you’d like to know. Hope all is well & keep up the great work. 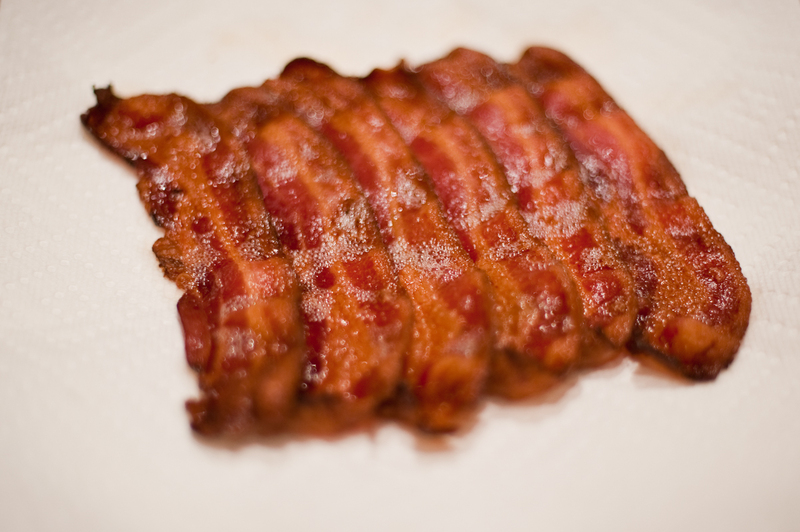 I baked bacon last night – omg, so good! I absolutely loved cooking it this way…Worked out really well before church…Just pop it in the oven and finish getting ready! Such a great idea! Thanks for sharing! I am making this RIGHT NOW! I can’t. wait. to eat it.